With the ever-increasing frequency and severity of school shootings and other forms of violence, it is time that we do something about it. Based upon International Level research by the Department of Education, Office of Juvenile Justice, the FBI, the Secret Service and others. 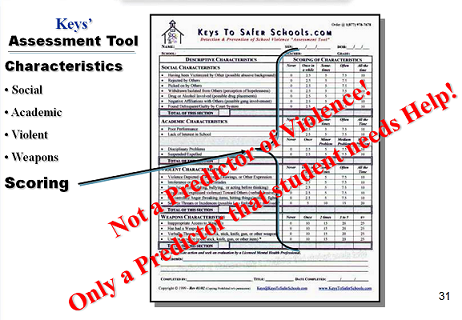 Keys’ has developed a most unique approach to the detection and prevention of School Violence. It looks at “Why” we miss these students, “What” to do to identify them, and “How” to provide help for them. There is an emphasis on identification, assessment and weighing of the Early and Imminent Warning Signs in students. 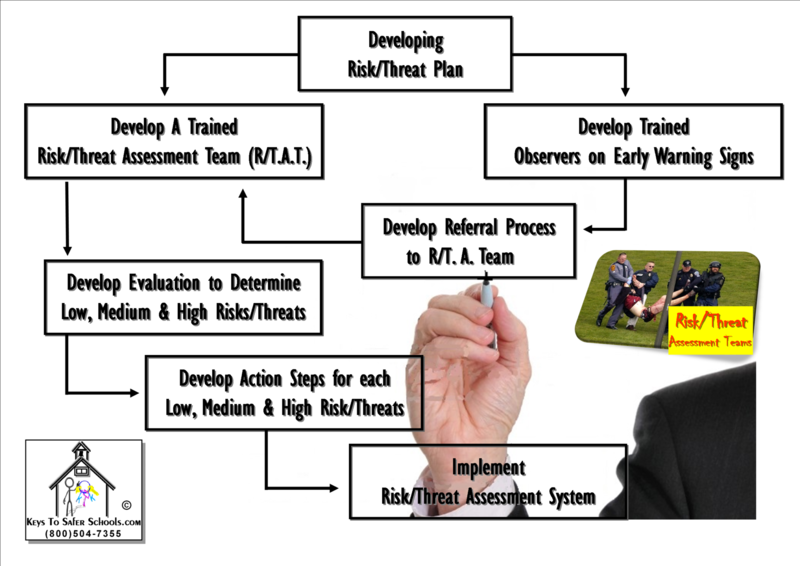 The full training provides schools a component of a Risk/Threat Assessment Team Model. The material in this training, which trains on the use of a powerful scored Assessment Tool. It comes from international research studies commissioned by the US and other Government Agencies. This MOST UNIQUE assessment tool is available today to be used with students to evaluation their risk to the student and staff population. This one-page assessment tool is designed for use by the non-Mental Health Professionals for identifying students who possess traits that indicate they may need immediate help. The material in this training and the tool comes from internationally researched studies commissioned by the US and other Government Agencies. Successful completion of the training leads to Certification to use and a License to Reproduce the copyright protected tool. A model is also presented for schools to implement a Threat Assessment Program. To utilize an Internationally researched system and tool to recognize students who may be exhibiting signs of being immediately suicidal or homicidal and get them the quick help they need before they become violent. Learn to recognize Early Warning Signs before it erupts. Learn the: “Why” we miss these students, “What” to do to identify them, and “How” to provide or get them the help they need. There is an emphasis on identification, assessment and weighing of the Early and Imminent Warning Signs in students. 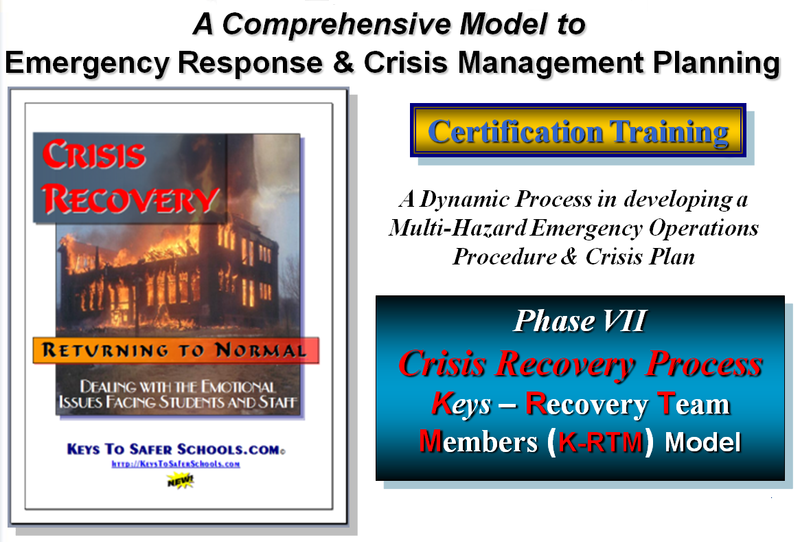 The full training provides schools a component of a Risk/Threat Assessment Team Model. This full day of training is power packed with information, techniques and training materials. How to develop an Risk/Threat Assessment Team and Model for your District &/or other youth oriented organizations. Highly acclaimed PDS Book who’s accompanying training share the same name. Certificate of Completion used for CEU credit. This training is “must have” for every school in the today’s world! The Arkansas-based Keys to Safer Schools.com offers an assessment test for selected school Staff to give which helps detect a child who is just a pranksters from one who is in need of help (a possible Potentially Dangerous Student). The test requires an educator to fill-out a one-page questionnaire on the child’s behavior and social skills. If the administrator answers yes to a number of Imminent Warning Signs, experts recommend having the student assessed by a Mental Health Professional to determine if the student is imminently suicidal or homicidal. The higher the student scores, the more immediate aggressive treatment is recommended. The test’s creators have weighted the scoring system to red-flag borderline cases, as well. They, too, want to err on the side of caution. Since the test’s unveiling in 1998, about 10 percent of the students who made jokes about violence were determined to need some kind of therapy. The remaining 90 percent were not considered not an immediate threat. This Model is used widely in the US, Canada & Europe. The key, Nelson contends, is teaching educators how to tell troubled students from ill-humored ones. Doing that, however, can be a difficult — if not dangerous — game.